Driving with a towing vehicle requires some additional safety measures that many people neglect. You might notice by now that simple side mirrors don’t provide an adequate view when you’re driving bigger vehicles, no matter how hard you try to adjust them. Therefore, towing a trailer or camper requires investing in a good set of towing mirrors. They provide a needed extension to help you see things behind your bulky vehicle. Furthermore, towing mirrors are a legal requirement in most countries, so you’ll be respecting the law by using them. Whether you want to remove your existing mirrors or to add clip-on or suction models, you need the best towing mirrors on the market. You should search for a reliable brand that offers towing mirrors to fit your type of vehicle, fulfilling size and view requirements. Luckily, the market is full of different towing mirror models, so you get to pick just the perfect ones for your vehicle. We are also here to help you go through the tiresome searching process, providing you a list of 10 best towing mirrors. Hopefully, you’ll be able to choose the perfect product for your needs thanks to our in-depth product reviews and recommendations. 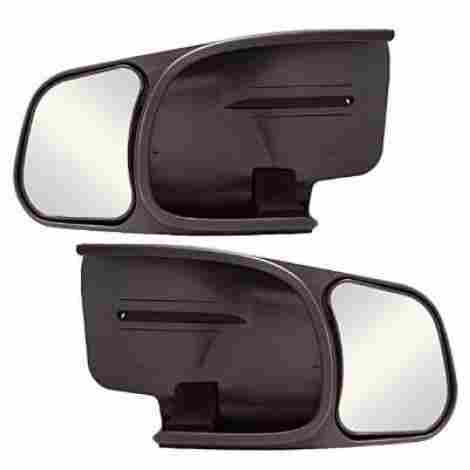 Our number one pick is a pair of sturdy towing mirrors that come from DEDC. These mirrors have many high-quality and useful features such as a textured Black ABS finish, a power control, turn signals, heating, and manual folding and telescoping. Overall, they offer every possible feature to ensure a safe ride when you’re towing a vehicle. DEDC offers a double-mirrored model – it has a large flat mirror on top and a smaller convex one at the bottom. These separate mirrors are designed to provide clear sight and better viewing angle. The top mirror is the one that comes with all additional features, while the bottom mirror is fixed and simply designed. 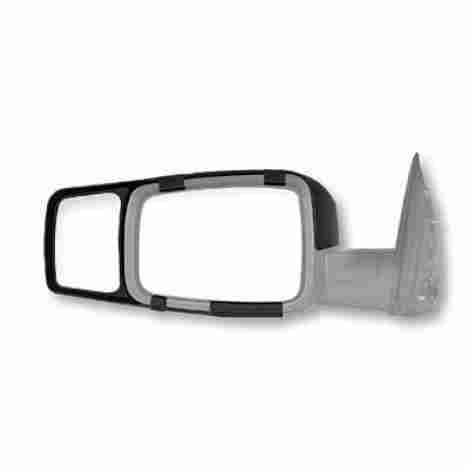 DEDC towing mirrors are OEE replacement mirrors which means that they have the same mounting brackets as stock mirrors. 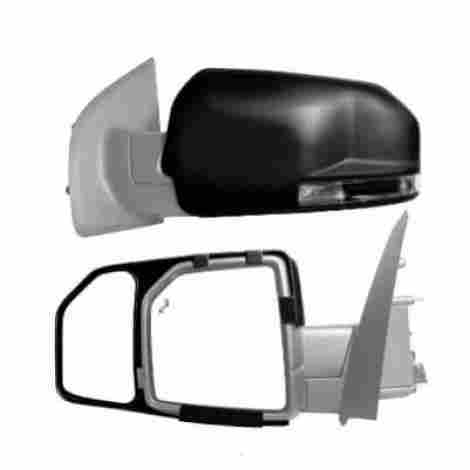 They ensure a proper fit to the vehicle and prevent frequent vibration that comes with regular aftermarket mirrors. 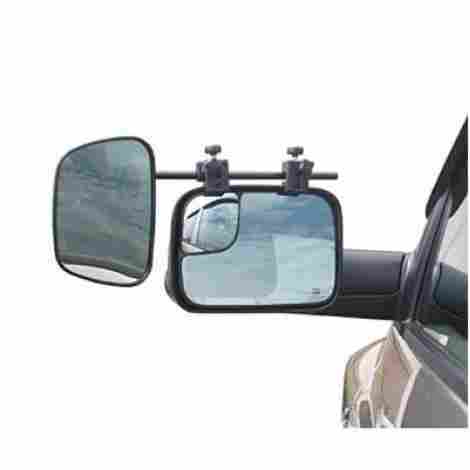 These towing mirrors are telescopic which means that they are manually adjustable on the length. You can easily extend these mirrors and adjust them so you can have a clear view. Additionally, featuring a textured Black ABS finish these mirrors will certainly last for a long time while still preserving their original black color. The materials are sturdy enough to ensure durability and excellent performance over the years. You can also replace them all on your own, avoiding the need for professional assistance. 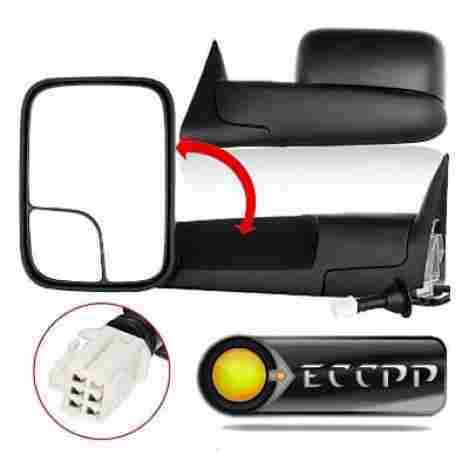 The only drawback is the color – DEDC towing mirrors come only in black color. DEDC mirrors are without any doubt one of the best towing mirrors on the market, but they do come with a sky-high price. Users mostly don’t complain about the price, saying that DEDC mirrors are worth every penny, but those who are on a limited budget might have to search for another option. Here we have another high-quality product that ensures safe driving. Dometic Milenco Aero 3 are very popular towing mirrors that offer excellent performance and durability. If you’re searching for versatile and simple-to-use towing mirrors to accompany you on your long rides and trips, this Dometic model is a perfect choice! Dometic offers versatile mirrors that can fit all types of vehicles. The thing is, these mirrors are actually a clamp-on type which allows you to install them easily on your existing side mirrors. A unique clamping system ensures smooth clamp onto both straight and curved regular mirrors. Additionally, no special tools are required for the installation. You can easily put them on and take them off as you please, which is quite convenient. These towing mirrors provide a wide angle of view, allowing you to see all behind your bulky towing vehicle. They have air balance features which reduce vibrations during the ride. However, some users did notice a slight vibration at a higher speed. Other than that, you shouldn’t have any major issues. The mirrors are made of sturdy and durable materials such as high impact plastic and stainless steel. These materials are perfect for mirrors because they make them resistant to harsh weather. The superior chrome safety glass also contributes to the overall durable construction. Dometic towing mirrors are definitely a wise pick if you want a product that provides outstanding performance and durability. It requires some extra cash, that’s for sure, but it’s absolutely worth it! You’ll get versatile mirrors that you can put on and take off according to your needs, ensuring a safe ride every time you hit the road with a towing vehicle. These Fit System mirrors are probably one of the most popular towing mirrors on the market. They are versatile, easy to mount, and incredibly well priced! If you’re searching for the best towing mirrors but you’re on a limited budget, this is a perfect choice. Follow our in-depth review if you want to find out more about this useful and popular product. Fit System offers universal mirrors that can fit any type of vehicle. They are clamp-on mirrors that allow you an easy installation. You can easily attach them to your existing mirrors within a few moments. No tools are required for the process. They provide a safe ride yet they don’t cover your side mirrors. Furthermore, these towing mirrors feature convex glass to ensure a wider view during every ride. If you still need to make more adjustments, you can turn them horizontally or vertically to get a proper angle of view (it’s a bit hard to adjust them though). Featuring a cushioning system, these towing mirrors reduce possible vibrations that occur at high speeds. They feature sturdy ratchet straps for more stability. However, keep in mind that some users complained about mirrors not being as stable as they should be. Make sure to attach them properly on your side mirrors to prevent accidental detachment during the ride. If you want universal towing mirrors that don’t require too much time and effort for the installation, Fit System is a perfect pick. This product is a real steal! You probably won’t find better performing towing mirrors for the same price. Here we have another high-quality product that's very popular among users because of its excellent performance and durable construction. CIPA offers towing mirrors that are designed to be an extension for your regular side mirrors and to ensure safe ride when you’re towing a trailer or a camper. They have many high-quality features, providing a long-lasting product suitable for many types of vehicles. You just can’t go wrong with CIPA! CIPA towing mirrors are specially designed to slide over your side mirrors for a snug fit. We were quite amazed by the strong and tight fit of these mirrors. They can withstand high speed without any vibrations. Using a wedge lock security system, you’ll be able to easily slide these mirrors into their place. This unique system will keep them secured for a long time. Additionally, CIPA won’t obstruct your existing side mirrors. These towing mirrors work as an excellent extension, providing a better angle of view when you’re towing a vehicle. Lastly, these mirrors aren’t as versatile as previously reviewed models of towing mirrors, but CIPA offers over 40 exclusive applications to fit various types of vehicles. 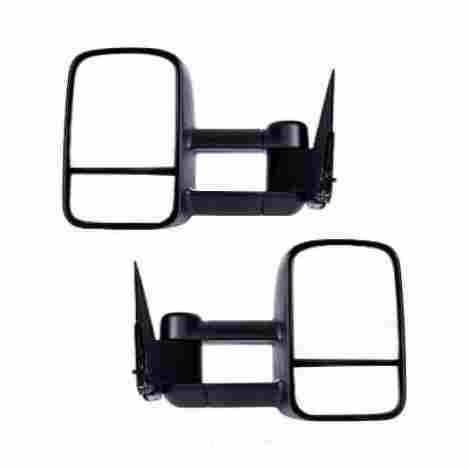 The installation of these towing mirrors is quite easy, and it doesn’t require any preparations nor tools. CIPA towing mirrors feature installation knobs made of durable ABS plastic – they are strong and rigid, providing durability during every ride. Additionally, the mirrors are made of scratch-resistant glass that contributes to the entire durable design. All of these materials are weather resistant, so you don’t have to worry about mirrors getting damaged during harsh weather conditions. Furthermore, we really liked CIPA’s sleek and modern design. These days, the market is full of bulky towing mirrors that look a bit out of place, and CIPA offers something quite different. However, we have to say that this sturdy design has one flaw – these mirrors give quite a resistance when you try to adjust them for a better view. As you can see for yourself, CIPA towing mirrors come with first-class features that ensure quality and durability. Besides, they come at a reasonable price, which makes them very popular! As you already know, the Fit System offers many types of towing mirrors. We had to include this model because of its first-class features and high popularity. These mirrors are also an excellent choice for those who are on a limited budget, providing excellent value for money! These towing mirrors have an aerodynamic design that provides a better view when you’re towing a vehicle. They are not universal, but they come in so many sizes that you’ll most certainly find perfect ones for your vehicle. The installation is quite simple, just snap these mirrors on the existing ones. You can easily do this without any tools, just make sure that you have secured the clamps properly. This should take only a few moments. Furthermore, what we really liked about this model is a modern design that suits every type of vehicle. We find it very appealing and stylish. Fit System continues with producing quality towing mirrors – these are made of sturdy and durable materials. They should last for a long time, providing an excellent rear view for many years. You can also fold them down when not in use rather than take them off and put them on every time you’re towing a vehicle. However, we have to address some issues that we had with these mirrors. Firstly, the scratch-resistant glass is very useful but we had problems with other types of scratches – mounting tabs are quite bulky and they hit the door when you try to fold the mirrors down. Secondly, keep in mind that these mirrors are flat. If you prefer convex mirrors, you should search for another product. As we already mentioned earlier, these Fit System Mirrors are well-priced. This is one of the main reasons for its popularity, along with appealing design and excellent quality. Therefore, this product is suitable for all those who want quality towing mirrors regardless of the budget abilities and limitations. If you are searching for affordable towing mirrors to help you out during risky towing situations, CIPA might be a perfect choice for you! We are talking about aerodynamic, versatile and durable towing mirrors that will fit your vehicle perfectly and provide an excellent angle of view. Follow our review if you want to find out more about this model of towing mirrors. These towing mirrors are not universal, but they come in various sizes to fit every type of vehicle – they are available in over 40 exclusive applications. 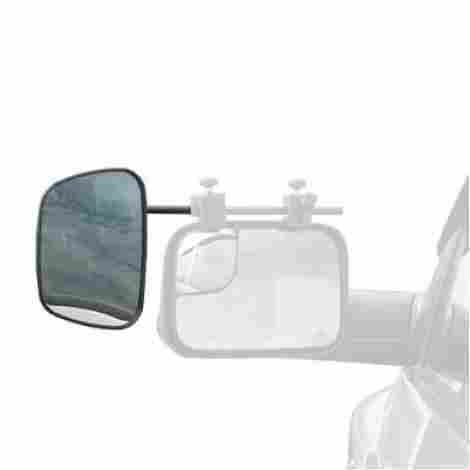 They are designed to be an extension for existing side mirrors and to provide better vision. The installation is very simple due to simple slide-on technology. CIPA mirrors easily slide over your side mirrors and stay in their place thanks to the wedge lock security. This unique design prevents any possible vibrations that can occur at high speed. Also, no tools are required for the installation, which means that you can slide the mirrors on and off whenever you want – this allows you to remove them when you’re not towing and put them back on when you need them again. We should only address that some users had problems with the installation regardless of all these provided features. It seems that sturdy design and wedge lock security make these mirrors harder to install on some types of vehicles. When it comes to materials, CIPA features sturdy installation knobs made of durable ABS plastic. There’s also scratch-resistant glass that ensures great visibility for a long time. What we liked the most is included neoprene tape that acts as a cushion, providing protection for your vehicle against scratches and damage that could occur during the installation. You can do the installation all on your own, without worries that you might scratch the mirror or the vehicle. Our only issue with these mirrors is a bulky design, they are not as sleek and stylish as we wanted them to be. While this is not such a big issue for most users, some people find it very important to have stylish towing mirrors to suit their vehicle. CIPA towing mirrors are incredibly well-priced. You’ll get a 1-year warranty for additional peace of mind, although these mirrors should last for years. Additionally, there’s excellent customer support to help you out if you run into any issues with the product. Here we have another excellent pair of Fit System towing mirrors that offers great visibility during every ride. These towing mirrors promote safe driving by providing a perfect angle of view every time you’re towing a trailer or a camper. You’ll be able to adjust these mirrors according to your driving needs and make the ride safe for passengers, pedestrians and other drivers. Fit System offers a pair of towing mirrors that provide a better view when you’re towing a vehicle. You’ll be able to easily install these mirrors using a clip-on technology which allows you to simply slide them over existing side mirrors. That should take only a few seconds. Also, the simple installation allows you to put the mirrors on and take them off according to your needs, you don’t have to leave them on when you’re not towing. However, if you don’t want to take them off, you can fold them down when not in use. These mirrors offer a manual adjustment which means that you can set them manually to fit your needs. They have a sturdy and durable construction that prevents any vibrations during the ride and ensures durability. What we especially liked about these mirrors is an original look – they have a sleek design that makes them look modern and stylish. However, we should address a big drawback that we had with this pair of towing mirrors. The mirror that goes to the passenger side is not made of convex glass. It makes the image larger, so you’ll have a hard time seeing the back of your vehicle clearly – you can see the lane next to you, but not the back corner or tires. Fit System towing mirrors offer excellent value for money. Except for the part with passenger’s flat mirror, they provide great rear view when towing a vehicle. Overall, you can’t go wrong choosing a model that comes from Fit System. If you’re not a fan of custom-fit towing mirrors, we have just the perfect product for you! JR Products features these incredibly valuable towing mirrors that have a universal fit – you can attach them to any type of vehicle with great ease. That’s not all, of course, so keep reading if you want to find out more about these excellent JR product’s towing mirrors. 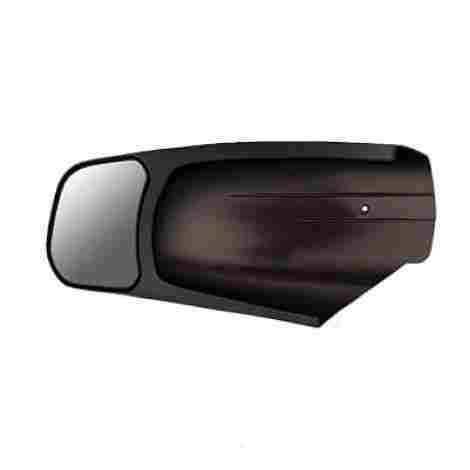 These universal towing mirrors are designed to fit all types of vehicles and every shape of side mirrors. They have a unique clamping system that allows easy attachment to existing side mirrors, without any parts that would obstruct the clear view from your side mirrors. Also, the installation takes only a few minutes, no tools are required. You’ll especially like the fact that these mirrors are wind tested up to 240 mph and they didn’t show any vibration during the test. They are secure enough to endure high speed and harsh weather conditions while still providing a clear view. However, keep in mind that all clamp-on towing mirrors can vibrate if they are not properly secured. That’s the thing with JR Products towing mirrors, too. JR Products offers sturdy towing mirrors made of high-quality and durable materials. Clamps are constructed of high impact plastic and stainless steel for a lifetime of use. The chrome safety glass has been tested and approved to applicable safety standards (E11). Overall, these mirrors should last for a long time, providing an excellent view for many years. You’ll also get a carrying case for easy storage. Simply designed clamp-on towing mirrors are always an excellent choice. They are the most versatile mirrors on the market, allowing you to use them on any type of vehicle. That’s one of the main reasons that makes JR Products towing mirrors very popular, regardless of the sky-high price. ECCP offers high-quality towing mirrors designed to provide excellent visual experience when you're towing a trailer or a camper. If you want a classy pair of towing mirrors to complement your vehicle, look no further! These mirrors offer an excellent view, durable materials, and many other useful features while still being stylish and modern. These mirrors are highly versatile although they are not universal. The manufacturer offers many different sizes to fit almost any type of vehicle. You’ll certainly find the one that is perfect for your vehicle. Not to mention that those who are fans of sleek and classy design will find these mirrors perfect for their needs. They are also foldable, so you can easily store them when not in use. The only drawback comes from the fact that you’ll most likely need to hire a professional if you want to install these mirrors properly. While a wide view is the best thing about these towing mirrors, provided stability is also very important. These mirrors have sturdy materials that provide stability during every ride – your view won’t be obstructed by annoying vibrations at high speeds thanks to the reinforcement brackets. Another useful feature is a heating element that keeps the mirrors defrosted during the winter. Furthermore, you get to adjust all these features at a simple push of a button. These towing mirrors offer high-quality features but we have to admit that they are quite expensive. Those who have some extra cash will most certainly benefit from these mirrors, but those who are on a limited budget will have to search for other options. The most important thing about every towing mirror is the ability to give you a clear view. They should provide a safe ride every time you hitch a cargo to your vehicle. Truth to be told, all products on our list provide an excellent view, which is the reason why they are our best picks. However, they do differ in some features that influence on their overall quality. For example, some towing mirrors on our list tend to vibrate at a higher speed which can influence the clear view. Some of them offer flat rather than convex glass, which can be a problem for many users. We tried to think about all these factors during the evaluation and to rank our best picks according to their overall quality. When it comes to towing mirrors, we all want to know that they can withstand harsh weather conditions or any bumps and scratches because damaged glass can cause blur view, preventing you to see the road clearly. There are towing mirrors that offer sturdy construction, featuring stainless steel, durable plastic, and scratch-resistant glass, and they are at the top of our list because they are long-lasting products that offer excellent performance for many years. The ones that are not as resistant as they should be are ranked lower on our list. Everybody wants towing mirrors that are easy to install. Who wants to bother with an exhausting installation or to reach for professional assistance? That’s why it was very important that every towing mirror on our list has a fast and hassle-free installation. Of course, some heavy-duty towing mirrors require more effort because they are bigger, providing a wide view of larger vehicles, but that doesn’t make them less good. It all comes down to users’ personal needs and preferences, but we had to think about all of this during the evaluation. No matter how much money do you have for your new towing mirrors, it’s important that you get a valuable and durable product. That’s why the balance of cost and value was such an important factor in the evaluation. We included cheap, expensive and reasonably priced products in our list in order to meet various budget requirements, and we rank them according to the value they provide for money. First and foremost, you have to determine which type of towing mirrors you need. How should I do that, you may ask? Firstly, you should take into account the size of the cargo that you’re going to tow. Its size will define the type of towing mirrors that you need – towing mirrors should be large enough to provide a clear view. There’s no use of small mirrors that don’t allow you to see behind your vehicle. Additionally, you have to determine how often you’re going to use towing mirrors. If you’re going to use them frequently, you should go for mirrors that you can easily take off from your side mirrors and put them back on when you’re towing. On the other hand, if you’re going to use them frequently, you should consider replacement mirrors as a permanent solution. If you’re a handy person and you love to do all repairs on your own, you’ll most likely want to have versatile towing mirrors that you can install without any professional help. However, towing mirrors offer many installation options such as a suction system, a clip-on system, or a total replacement option, and you’ll need to determine which option suits you the most. 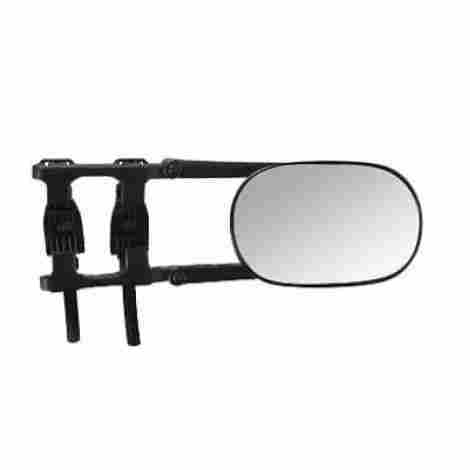 Suction cup mirrors are designed as an extension that attaches to existing side mirrors. This can be a bit tricky to install because of the suction cup. Mirrors that have a clip-on system with clamps are easiest to install, but they can cause vibration if you don’t tighten them properly. Lastly, replacement towing mirrors come as a replacement for your old side mirrors, and they usually demand a lot of effort to install. A limited budget can drastically influence our buying decisions. However, you can get a decent pair of towing mirrors even when you don’t have the fortune to spend. For example, all those additional features such as heating options, LED arrows, and carrying cases are the things that you can live without. Therefore, think about the things that are essential for you and search them in towing mirrors. That way, you’ll be able to purchase a well-priced product that meets your needs. Q: What are towing mirrors? A: Towing mirrors are an extended version of side mirrors that provide a better rear view when you hitch a trailer, camper, or another accessory to your vehicle. The bigger your vehicle gets the bigger mirrors you need, and regular side mirrors are not large enough to reflect the length of your additional load. That’s why towing mirrors are essential – they make the ride safe and help you avoid dangerous collisions. Q: Do I really need towing mirrors? A: Many drivers of large tow vehicles are acting as they can easily drive without towing mirrors, but the law begs differently. According to the legal requirements you have to have towing mirrors. They allow you to see an area behind your towing vehicle, and regular side mirrors can’t provide that range of clear vision. Therefore, towing mirrors are a must if you want to respect the law and drive safely. After all, keeping passengers, pedestrians, and other drivers safe is the most important thing for all of us. Q: How many types of towing mirrors are there? A: These days, towing mirrors offer many installation options, allowing you to easily attach them and avoid wasting your money on professional assistance. For example, clip-on towing mirrors can be successfully installed within a few moments. They have simple clamps that you should switch over existing side mirrors, and that’s about it! A suction cup mirrors are also simple to install, but they can be a bit tricky because of the cup that has to fit snugly to the side mirror. Lastly, replacement mirrors usually require some professional help because you’re changing your side mirrors completely. You can still replace them on your own, but they require more effort and probably some tools. Q: Which towing mirrors are the best? A: Well, it really depends on your personal needs preferences. After you determine the size of your vehicle and the cargo you’re towing, it depends whether you want clip-on mirrors, suction cup mirrors, or replacement mirrors. You should also consider some additional factors such as the type of glass and other materials used in the construction of the mirror, overall design, and others. If you are not sure what to look for in towing mirrors, you can follow our recommendations listed above. It should help you choose the perfect product for your needs.